The musical includes the hit song from the movie Up Where We Belong along, with 80’s classics such as Alone, Don’t Cry Out Loud, Girls Just Want to Have Fun, Toy Soldiers and Material Girl and features one of the most iconic romantic scenes ever portrayed on screen. 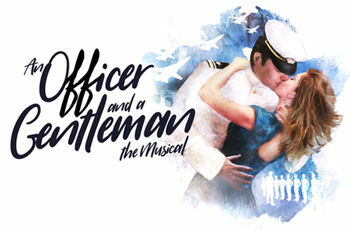 AN OFFICER AND A GENTLEMAN is one of the highest grossing films of all time. The screenplay is by writer and director Douglas Day Stewart which was based on his personal experience as a Naval Officer Candidate. The book was co-written by Douglas and Sharleen Cooper Cohen. Jamie Wilson is the lead producer on the current productions of Crazy For You, the forthcoming world premiere of Nativity! The Musical and Curve’s production of Sister Act. Director Nikolai Foster said, “An Officer and a Gentleman delicately charts the lives of working class, military folk in America in the early 1980s; important lives, often pushed to the margins of society. We are proud to be working alongside the film's creator Douglas Day Stewart, producer Jamie Wilson and an incredible creative team to present this beautiful and inspiring story. This brand-new adaptation includes iconic 80s songs which create an entertaining, uplifting and original piece of musical theatre, we are excited to share this world premiere with our audiences here in Leicester and across the U.K”. Nikolai Foster is Artistic Director at Curve, one of the UK’s leading regional theatres. His work at Curve includes Joe Orton’s What the Butler Saw, Jim Jacobs and Warren Casey’s Grease, Oscar Wilde's The Importance of Being Earnest, Legally Blonde, Truman Capote’s Breakfast at Tiffany’s. He directed the hugely successful recent productions of Annie starring Miranda Hart which is now showing in the West End, and Calamity Jane which starred Jodie Prenger. Joining director Nikolai Foster on the creative team are Choreographer Kate Prince, Musical Supervisor Sarah Travis and Designer Michael Taylor. Kate Prince is the founder and director of ZooNation. She was nominated for an Olivier Award in 2009 for Into the Hoods and most recently choreographed the hotly anticipated West End transfer of Everybody’s Talking About Jamie. Sarah Travis’ previous credits include Sweeney Todd for which she won a Tony Award, Sister Act, and currently A Little Night Music playing at The Watermill Theatre. Michael Taylor is an Olivier Award nominated designer with his most recent work including What the Butler Saw, Silver Lining, A Christmas Carol and The Dresser in the West End. Lighting Design will be by Ben Cracknell and Sound Design by Tom Marshall.